My old school friend who is now living in the US with her American husband co-founded this charitable organisation called “Toys for Thailand” back in 2005. Toys for Thailand’s main aim is to improve quality of lives of Thailand’s hill tribe children through health and educational promotions. My friend, Sasha, started this by collecting her own kid’s and friends’ and neighbours’ unwanted toys and gave them away to the children in need in Thailand whenever she went home to visit. Her initiative has now snowballed into the organisation (sorry, Sasha – still British English spelling here:) that provides supports to more than 20 schools in remote parts of Thailand’s northern province of Maehongson. 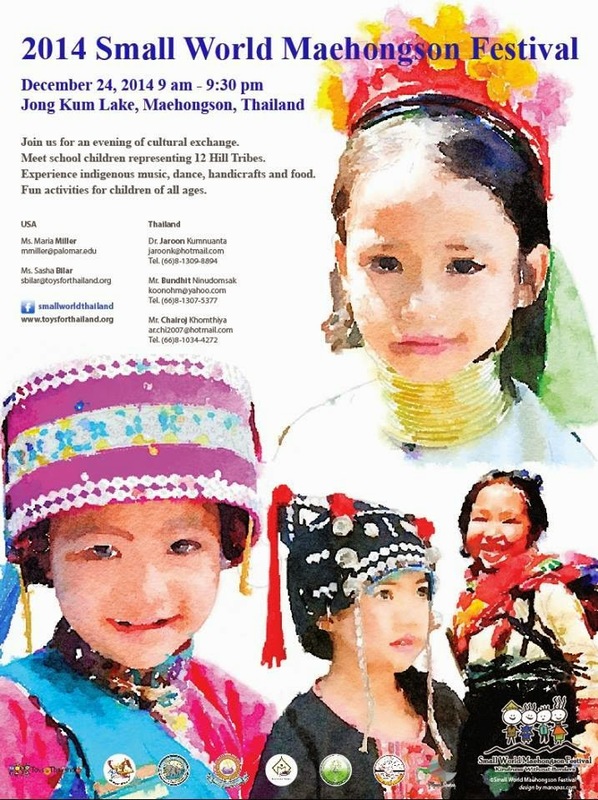 Small World Festival is an annual event that T4T co-sponsors every year on Christmas Eve in Maehongson City Centre where hill tribe school children and their teachers showcase their wares and cultural traditions. So if you happen to be in Thailand around Christmas, you might like to take an excursion to join the festival in Maehongson. Wherever you are planning to be, spare a moment to think of these children and give a little through T4T’s website.